Birthdays, potlucks, and all sorts of get-togethers require food. And, who doesn’t love a good party? Anyone living with diabetes might find parties a bit intimidating, specifically when it comes to finding diabetic friendly foods. You don’t want to miss out on all of the festivities, so you have to learn how to navigate the buffet tables and party trays. Parties can be overwhelming when it comes to maintaining a healthy diet. There is food everywhere, and you aren’t always exactly sure what everything is made of. Therefore, it is always a good idea to start with a few general rules that will help you make the best decisions possible. Avoiding bread based appetizers and other food is a great rule not only for parties, but for eating out as well. You want to avoid filling up on empty calories and simple carbohydrates that will raise your blood sugar. Some bread based foods are honestly almost just as bad as eating sweets, so keep away from those options. Depending on what else you are piling on your plate, a sandwich probably won’t hurt you as long as it is filled with something protein rich, like meat and cheese and vegetables. Most sauces are going to be full of sugar and lots of sodium, so try to keep those to a minimum. Those meatballs swimming in sweet barbecue sauce, for example, are practically candy. If you’re going to have a few of the meatballs, try to remove as much of the sauce from them as possible. Be careful about casseroles as well, unless you’ve got a lucky hook up and know the ingredients are safe. It is generally okay to assume that some dips, such as those based on beans, are probably safe given the amount of protein from the main ingredient. Other dips, such as salty dips and dressings, should be eaten only in moderation. Also, as a general rule for dips, stick to vegetables for dipping instead of bread, chips, or crackers. This will save you from a good portion of carbohydrates. Veggie Platters: As long as every bite isn’t absolutely swimming in dressing, veggie platter offerings are always a great way to fill up on party offerings. You can usually find a veggie tray at just about every party and buffet. Not only will this often be the healthiest option, but sometimes at parties, people tend to overeat while socializing. With veggies, you don’t have to worry about overdoing it by mindlessly munching on fresh veggies. Cheese Trays: Cheese and crackers are a popular go-to party favorite that can be found at most parties. While you do need to be careful about how many crackers you eat, cheese is generally safe and full of protein. Just remember how much fat and cholesterol you might be consuming also, and don’t overdo it. Cheese makes a great balance food for the fruit tray as well. Meaty Options: From lunch meats to cocktail weenies and meatballs, you will generally find a meat based dish that will offer you enough protein to balance out your other options. Just remember to watch out for those sneaky sauces. Diabetes does not mean you have to skip out on all the great parties. 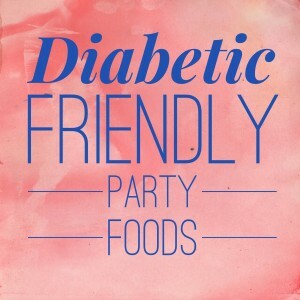 With a little vigilance and self-control, you can find great party foods that are diabetes friendly and enjoyable. Going in with these tips and techniques will help you. For more diabetic friendly foods, click here.